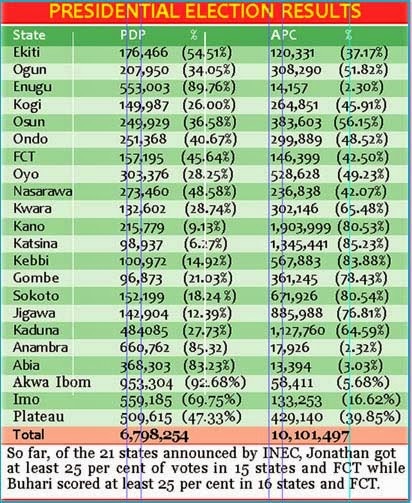 Major-General Muhammadu Buhari (rtd) was last night sustaining his lead over President Goodluck Jonathan in the declared results of the presidential elections released by the Independent National Electoral Commission, INEC, last night. Main opposition All Progressives Congress (APC) presidential candidate Mohammadu Buhari casts his ballot at a polling station in the “Gidan Niyam Sakin Yara A ward” at Daura in Katsina State on March 28, 2015. Voting began in Nigeria’s general election but delays were reported countrywide because of technical problems in accrediting electors.